This is the first comprehensive book written about Egypt´s development. It brilliantly spans two dramatic and dissimilar Administrations, that of Gamal Abdul-	Nasser and Anwar Al-Sadat. 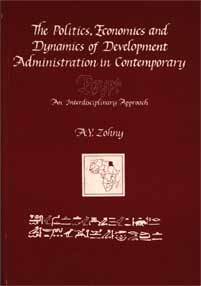 Utilizing an interdisiplinary approach, Dr. Zohny draws from the tenets of politics, economics, sociology and management science to reveal at long last the real impact that the decisions of these two formidable presidents had on Egypt´s development. From the extreme left under Nasser to the extreme right under Sadat, the author traces the Egyptian policy making process to provide rare perceptual insights into the issues of development and the outcomes of their decision-making. As a native Arabic speaking scholar, Dr. Zonny provides the reader with an original and well documented study which he has researched thoroughly in both Arabic and English sources. I am sure that scholars of the Middle East and African Development, as well as laypersons interested in understanding the often hidden workings of the development process will find this work valuable for its fundamental and far reaching grasp of development issues and the political process.